Tear open package beginning at the notch. Gently pull the top towelette out of the pouch. Towelettes should be pulled at an angle to dispense one at a time. Reseal the pouch to prevent the wipes from drying out between uses. Unfold towelette and wipe evenly over exposed skin. 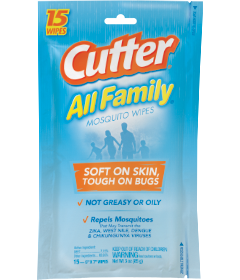 Use just enough repellent to cover exposed skin. Do not use under clothing. When using on face, apply sparingly, avoiding eyes. Do not apply near eyes and mouth. Apply sparingly around ears. Do not apply over cuts, wounds or irritated skin. Do not apply to sunburned skin. Do not apply to children’s hands. Do not allow children to handle this product. Avoid overapplication of this product. After returning indoors, wash treated skin with soap and water and double-check yourself, other family members and pets for ticks. Wash treated clothing before wearing it again. Will not damage nylon, cotton or wool. Wipe hands after application as product may damage some synthetic fabrics, plastics, watch crystals, leather, painted or varnished surfaces. Use of this product may cause skin reactions in rare cases. If you suspect reaction to this product, discontinue use, wash treated skin and call your local Poison Control Center. If you go to a doctor, take this product with you. HOTLINE NUMBER: In case of an emergency call toll free 1-800-767-9927.